Young people in foster care face a range of unique risks when it comes to identity theft protection and cyber security risks due in part to the abundance of people with access to their personal information. LifeLock/Symantec has a history of supporting foster youth and this year we expanded ourinvolvement and increased our commitment to protecting this vulnerable population. 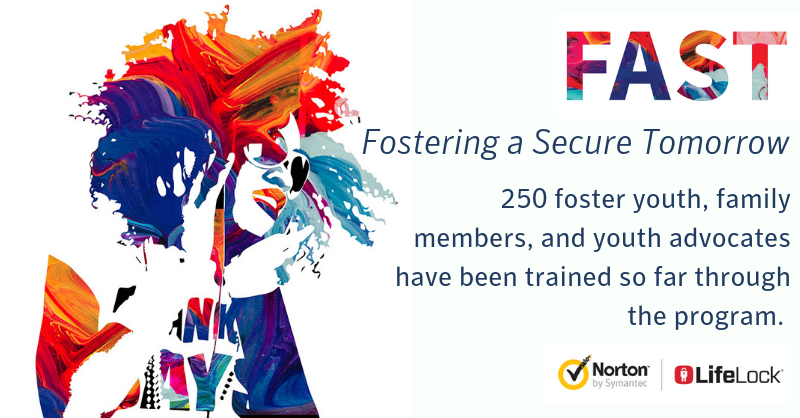 In March, we launched the Fostering a Secure Tomorrow (FAST) initiative, in Washington DC in an effort to educate politicians and policymakers on the importance of keeping foster youth safe online. Foster youth move frequently and their personal information is passed from person to person. The FAST initiative is working to help foster youth restore their identities as well as curb the heightened risks of identity theft through education, tools and services. Education: Symantec is providing free in-person training, workshops, webinars, and online resources to help change behaviors that make foster youth vulnerable. Since March, Symantec has created a foster-youth focused curriculum on identity theft and digital hygiene and trained 70 Symantec employees to lead these training around the country. From North Carolina to California, these trainers have shared important identity theft tips and tools with 250 individuals so far, including youth in foster care, families hosting foster youth, and service providers. These trainings include an overview of what digital safety is, what credit is, how to reduce vulnerabilities, and how and where to find identity protection help. Tools: Symantec donates easy-to-use Norton security antivirus and VPN software to help keep foster kids’ identifiable information safe. Twenty foster families in Temple, Arizona have received Norton Security Deluxe devices since FAST’s launch. We’ve also donated two Norton Small Business one-year subscriptions to secure new laptops for foster youth in San Jose, California, and provided grants to three local nonprofits servicing foster youth, The Bill Wilson Center, Aid to Adoption of Special Kids (AASK), and Promises2Kids, as well as two national nonprofits iFoster and ITRC. These efforts are in addition to the software donations made to nonprofits in need, including those like Smooth Transition that service foster youth, through our 16-year partnership with TechSoup. In FY18 we donated our software to more than 22,000 nonprofits in 55 countries. Services: Twenty-two percent of foster youth between the ages of 14 to 17 in California had at least one credit issue revealed on their credit report, according to iFoster. For young people participating in our program whose identities have been compromised, LifeLock identity restoration services are provided free of charge. In addition to our identity theft work, Symantec supports Together We Rise, a nonprofit dedicated to changing the experience for children in the foster care system. At our recent CBU Marketing Conference, employees created 375 birthday boxes to help foster youth celebrate their special day. Creating these boxes was Symantec’s largest service project to date. We’ll continue to foster a secure tomorrow for foster youth. Check back soon to see our video on the top ten reasons why foster youth should care about identity theft and for the launch of our white paper, The Experience of Foster Youth with Identity Theft in America.